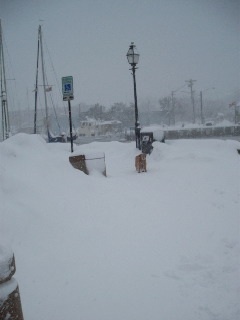 Downtown Annapolis— the benches at City Dock at Ego Alley are completely buried. 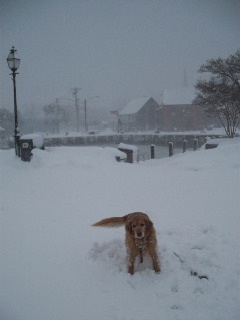 Our golden retriever in front of Ego Alley, downtown Annapolis. Rain, snow, sun, or shine; my husband Peter and I try to start every day by taking our dog Grace of Naptown for a walk. Grace officially belongs to our daughter Alex, but she likes to sleep in whenever she has the opportunity. Despite the howling winds and blizzard conditions, today was no exception. Grace loves the snow. She jumps and romps through all those snow drifts, smelling all the “good smells” of the dogs who have passed that way before her. Although there is a ban on driving in the city of Annapolis, there were plenty of SUV’s downtown. Open and serving breakfast was Chick and Ruth’s Deli as well as Hard Bean Cafe and City Dock Cafe. Many of the downtown regulars were there including musician Rob Levitt who walked across the bridge from Eastport. Because the walk from our Murray Hill neighborhood took twice as long due to the volume of snow, I took note of some business openings and closings. Avoca Handweavers, is closing soon, one of my favorite stores for beautiful hand knit sweaters from Ireland. Everything left is 50% off, but of course they are not open today. A new store Wood Artisans selling handcrafted furniture is opening up in the former location of the Sport Memorabilia store on Main Street next to the store specializing in hooked rugs. Although no bagels were delivered this morning to City Dock Cafe, they did have fresh baked scones and muffins. After drinking some hot coffee to warm us up we took a closer look at the waterfront and Ego Alley. The benches are completely buried. No shoveling in the City Dock area downtown! With the severe weather, it was no surprise that Rob opted for a ride back to Eastport offered by a neighbor, rather than trying to brave his way across the bridge to the Maritime Republic of Eastport. However, Peter, Grace and I did forge our way back up Main Street, down Upper West Street where businesses were attempting to get their sidewalks cleared, and up and over to our neighborhood. To those who have asked me whether our street ever did get plowed, I have to respond, “Not really.” Evidently our street, although it is a connector between two well traveled roads, doesn’t rate according to the City of Annapolis. A neighbor we encountered on our way home who lives on a very small side street told us they finally got their street plowed by sweet talking a contractor working for the city with a shot of booze and some warm vegetable soup. Grace’s long fur was caked with snow and after getting cleaned off she was happy to curl up under my desk for a long nap until it’s time for her next walk… this evening. I suppose the title is a tad dramatic. There was one carton of eggs with three that were broken, but other than that the case was empty. This lack of eggs took place yesterday afternoon February 8th at the one Annapolis area Safeway store that was open, the one off 450 next to Best Buys. The other two, the one in Annapolis off Forest Drive and the one in Edgewater were both closed due to lack of accessibility by delivery trucks. Another snow storm is presumeably on its way dumping as much as 18 more inches! The snow seems to bring out the best in some people– helpful neighbors, and thoughtful co-workers but it also can bring out the worst as folks push their way to grab up the last grocery supplies and go joy riding through snow banks clogging up the roadways and preventing the passage of emergency vehicles. When will it all end? At least I live in walking distance of downtown, so I’m never completely snowbound. Walking to work was definitely an adventure, with no sidewalks cleared on West Street. Several times I needed to jump atop a snowdrift on the side of the road, just to stay out of the path of a passing truck. Will they ever clear my street? Stay posted. 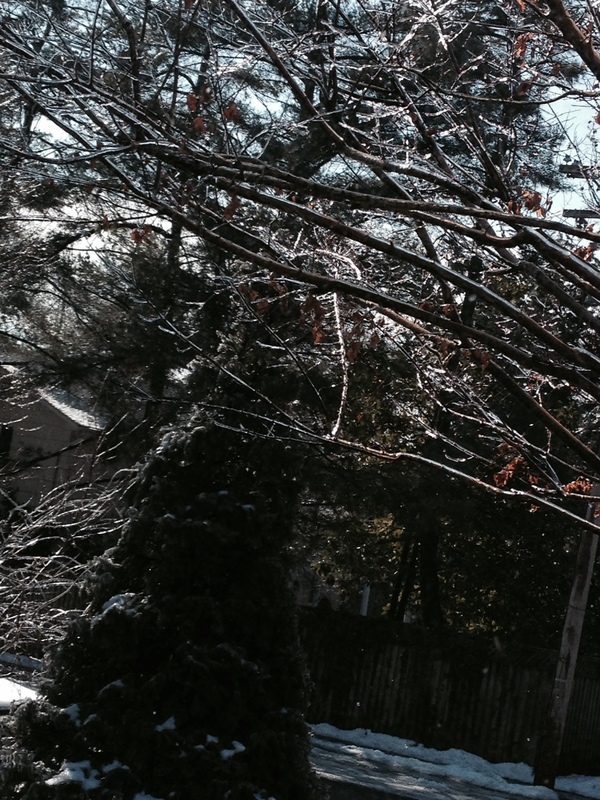 The City of Annapolis has 87 miles of snow to clear. The City of Annapolis asked residents not to drive. The ban on driving was lifted at 6:00 a.m. this morning, Monday February 8th, but that didn’t stop some foolhardy folks with nothing better to do with their four wheel drive vehicles than clog up our roadways. One of them get stuck on my street, right in the middle of the road of course, making the passage of a snow plow impossible, Finally neighbors and a hired shovel helped them to get dug out 16 hours later and then another car almost got stuck in the same place! With 87 miles of roadways to clear, there’s a lot more to be done before the next possible deluge of snow flakes–another five inches perhaps? Last night, although the main highways were partially cleared, the on and off ramps were icey and full of snow. In downtown Annapolis many sidewalks are still heaped high with all that white stuff, making it a challenge for pedestrians to get anywhere without taking to the streets. It’s a real slip and slide. It’s when I start thinking about how much money this is costing the city, county, and state, for all the clean-up, that I really start to worry. In Annapolis, we are already short approximately five million dollars, but with this snow clean-up, the deficit just increased in a big way. The landscapers, contractors, and anyone with a hardy constitution and a snow plow or shovel, however, has the opportunity to make some money as the rest of us struggle to dig out from under all that snow! Hopefully all those who do gain money from the snowstorms will put some of that money back into our local economy and it will help our hometown businesses including our restaurants and shops. Happy sledding!